As with other hound varieties, we will probably never discover the true origins of the Basset Griffon Vendéen. However there is much we do know, from the early evidence of rough-coated Segusian hounds,leading up to the time when reliable information is available. With skilful breeding, peaking during the latter part of the 19th century, shorter-legged rough-coated hounds, identified with the specific regions of France - including the Vendée - began appearing. Lastly, the 20th century gave us the Basset Griffon Vendéen as we know it today. The Vendée has always been typically good hunting country and the type of hound that evolved in this region was ideal for foraging through dense undergrowth, with its rough, wiry coat giving good protection against thorns and brambles. 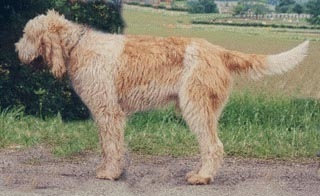 Three types of rough-coated Vendéen hounds stemmed from the Grand Griffon Vendéen, a dog of some 60-65cm, with a strong frame but without heaviness. These were the Briquet (50-55cm); and, divided by height and type, the Grand Basset Griffon Vendéen (39-44cm) and Petit Basset Griffon Vendéen (34-38cm). From 1863 onwards basset-type, shorter-legged, hounds were shown in France at the first dog show held in Paris, where masters of hunting packs had been urged to attend. At first they were of poor quality with no distinction between smooth-coat and rough-coat. 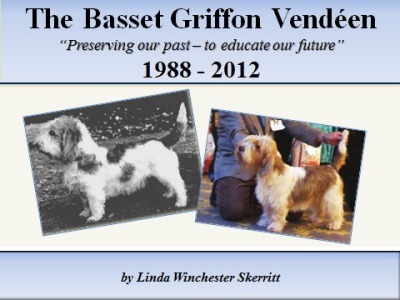 From this time onwards we see how dedicated breeders began to influence the future of the Basset Griffon Vendéen. The le Couteulx family of Rouen had been bankers for several centuries and Comte le Couteulx de Canteleu carried on the family tradition. He was also a well known dog breeder. 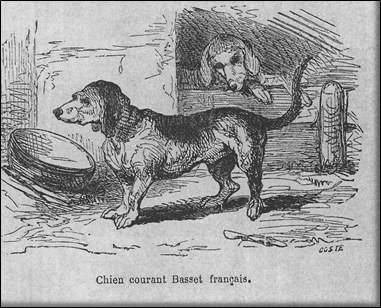 His influence on the destiny of the smooth-coated French hunting dogs (the future Artésien Normand) was notable and his ardour for venery led him to contact enthusiasts in many countries, including the Chairman of the newly-formed British Kennel Club, Mr S Shirley, Member of Parliament, when he sent an illustration of a hybrid animal. Le Couteulx wrote several books on hunting and, in one of his treatises, he expounded "In the past it was in heavy undergrowth that the most beautiful packs in France used to go out". He described these dogs as having "a wiry head; supple, thin, long, falling ears; finely textured, short coat and tapering tail". These were probably the ancestors of the present day Griffons Vendéens, the rough-coated Vendéen hounds, as it was between 1830 and 1870 that a heavy-coated "griffonée" or harsh-coated type first appeared and then developed. 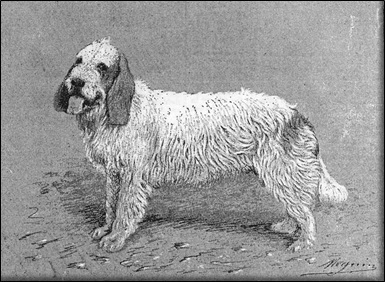 By 1870 Le Comte d'Elva had perfected his Ricoudet pack of hounds, having started off with a female Basset Griffon and a fauve-coloured, male Basset de Bretagne. His hounds had a typical Griffon Vendéen coat “mainly white, marked lightly with orange or tri-colour, with straight front or feet turned out slightly. They measured 13½-17ins (34-43cm) with an average height of 15½ins (39cm). In 1873 the last exhibition took place at Paris Jardin d'Acclimitation. This year also saw the foundation of the great hunt kennels at the Jardin, aiming to have one section for hunting dogs. Amongst the breeds was one Basset de Vendée. By 1875 Le Comte d'Elva's Royal Combattant was attracting attention, a straight-limbed, tri-colour male of 43cms (17ins). At the top end of the height range for a BGV, he became the count's favourite stud dog. Twelve years later Ernest Ambaud, living in Le Havre, showed evenly-sized à poil dur (rough-coated) Vendéen Basset Hounds. It had taken him some ten years of breeding to achieve uniformity of type. He did this by eliminating constantly from his litters “first smooth-coated dogs, then silky-coated ones. When he started, half the puppies were smooth-coated, a quarter were silky and the remainder harsh-coated. Five years later the smooth ones had almost disappeared. Out of five or six litters “altogether sixty dogs“ he had only one smooth-coat. However, out of nine or ten whelps there were still one or two with silky coats, the others were wire-haired. He achieved uniformity of height but found a remarkable tendency for the breed to get shorter. de Villebois-Mareuil, Louis Leseble, M. Ambaud and, of course, Dezamy. 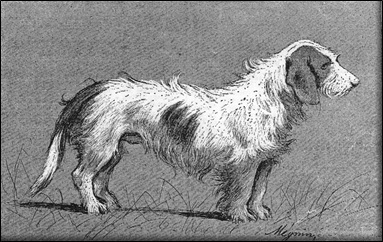 M. Ambaud's favourite stud dog, the shorter-legged Castilleau, "transmitted his virtues admirably to his progeny with a vigorous and clean head, flat and pliable ears, falling down well, straight legs, perfectly-cut feet, and well made, of an iron constitution, for he has never been ill". By the late 1880s, athough d'Elva's hounds had achieved a certain amount of success at exhibitions, they no longer dominated the bassets à poil dur. He therefore formed two separate packs “one of the shorter-legged bassets for chasse à tir (hunting with a gun), the other of briquets for chasse à courre (hunting larger game to death). His hounds made a great contribution to establishing type and earned him the soubriquet Father of the Basset Griffon Vendéen. In 1896 the Club du Basset Francais was founded to bring about some form of standardisation and to separate the French Bassets as definitive in their own right. 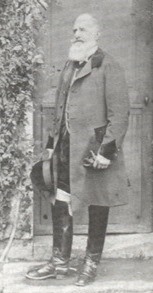 Le Comte d'Elva, became President of the long-haired Bassets  section of the club and devoted his time to writing a Standard for the breed known as the Basset Griffon Francais. Two years later, the Club du Basset Francais Standard for the Basset Griffon Francais was approved. Leading into the 20th century and up to World War I, two important breeders dominated the smooth and rough-coated Bassets: Leon Verrier for his bassets à poil ras (smooth-coats) and Paul Dezamy for the bassets à poil dur (rough-coats). M. Dezamy was looking for a "hare hound, quick enough for the Vendée terrain where hunting on horseback was almost impossible. His Bassets Griffons Vendéens became the role model for the breed. 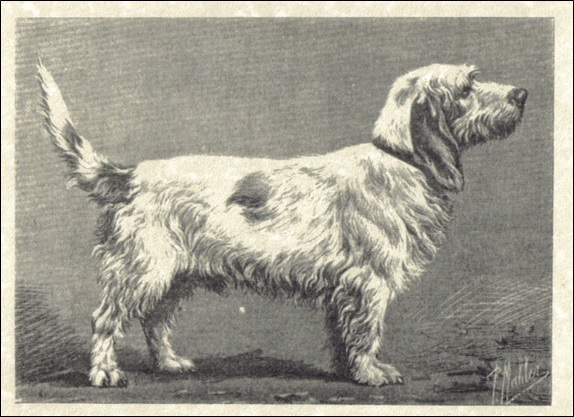 In 1903 he won many awards at Paris shows and established himself as an important breeder of true Bassets Griffons Vendéens with straight forelegs. His dog, Farino, was crowned a champion at the Paris show - his first champion BGV. 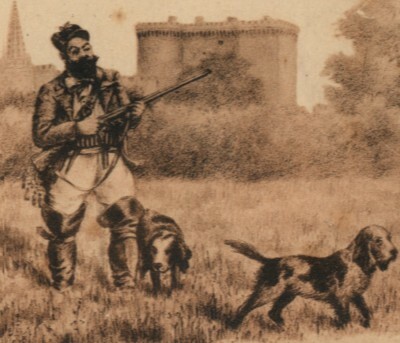 Four years later he and his hunting companions decided a locally run club would serve the Griffon Vendéen interests better so the Club du Basset Griffon Vendéen was founded with its headquarters at La Chaize-le-Vicomte. At the first general assembly of the club, Comte d'Elva was elected as President of Honour and Paul Dezamy as President. The Livre d'Enregistrement du Basset Griffon Vendéen (BGV Record Book) was opened. Two types are recognised. One, from 0m 34 to 0m 38, the most often with semi-crooked legs. The other, from 0m 38 to 0m 42, must always have straight legs. By 1922 under the direction of Paul Dezamy, the breed was flourishing in the hands of the new Club du Basset Griffon Vendeen. Moreover, due to the Vendées somewhat isolated geographic position, the BGV fared better than other breeds during World War I. Original club members continued to hunt with the larger type Dezamy BGV as they had become known. These swift, taller BGVs were ideal for hunting hare in large, open areas. However, in July that year the club acknowledged the need to nurture the smaller rabbit-hunting variety, recognising that they worked well over a smaller area. The hounds were also easier and cheaper to keep. Many were distinguished by type of leg. With classification still based on crooked and straight front, the breed standard continued to place emphasis on height: 34- 38cms (13½-15ins) and 38-42cms (15-16½ins). Straight legs were always required for the larger BGV. In 1924 the club changed its name to Club du Griffon Vendéen after accepting the Briquet and, shortly after, the Grand Griffon Vendéen into its register (RI orRegistre Initiale). This was a book recording all information on each dog. Comte d'Andigne started work on a set of Standards for all French scenthound breeds. 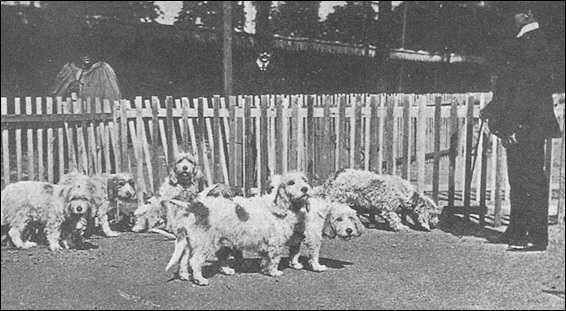 In just three short years and despite there being many of the smaller variety hounds being of mixed type, by 1927 those showing the true petit type were evident. At the Exposition Canine Internationale d'Orleans in 1935, for the first time classes for BGVs were separated into à jambes demi-torses de 0m 34 à 0m 38 (half-crooked) and à jambes droites 0m 38 à 0m 32 (straight). But, not long after, yet again a World War affected hunting. However fortunately, due to their location, the Bassets Griffons Vendéens suffered less than other hunting breeds. In the post-war years it was left to huntsmen to restore the BGV to its pre-war glory. During this period of regeneration, it became clear that the Petit Basset needed an independent Standard to separate it from the Grand Basset Griffon Vendéen. Spurred on by Paul Daubigne's view that, except for the height, it was illogical to have the same Standard for both breeds, Abel Desamy started to write one specifically for the Petit. It described a dog that was more square in construction and had less dramatic features than those of the Grand Basset. In 1951-52 the new Standards were agreed, allowing the registration of separate breeds. However, cross-breeding had been carried out for many years, especially between the Grand Basset and Briquet, whose numbers had declined dramatically during the war years, so the club ruled that if necessary a puppy registered as one breed could be changed to another when adult. For this reason, "non-specific" registrations were given in the RCGV (Register of the Club du Griffon Vendéen) until after examination at one year of age. 1966 saw the Standard for the Petit Basset Griffon Vendéen being issued by the Federation Cynologique Internationale (FCI). In 1972 Hubert Desamy, who had assumed the role of President Elect and taken over responsibility for club affairs, asked breeders to stop inter-breeding between the Grand Basset and Petit Basset Griffon Vendéen. However, having not yet become President, he was unable to force the issue. By 1975, Hubert Desamy had taken over the Rallye Bocage and become President of the club on the death of his father. Thoughts returned to separating the Grand and Petit Basset and progressing the renaissance of the Grand Basset Griffon Vendéen especially the type Dezamy, made popular in the 1920s. In 1977, with his position of authority as Club President, Hubert Desamy finally banned inter-breeding. 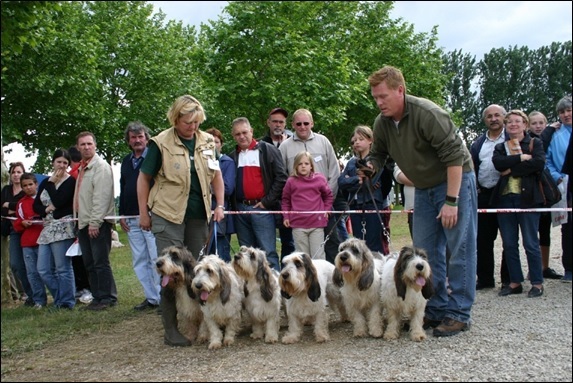 From 1 January, the Grand Basset and Petit Basset Griffon Vendéen became officially separate in breeding terms. Breeders realised however that, for many years to come, litters might produce puppies bearing characteristics of either breed. For this reason, they continued the process adopted in 1952 of having every young BGV assessed when one year old to decide whether it was a Grand Basset or Petit Basset. This examination was done by an independent "confirmateur", judge or knowledgeable person acting on behalf of the club. After Treasurer, Renaud Buche, took over the Presidency of the Club in 1985. Committee records and the RCGV were handed over to the new President, however many other historical records, photographs and writings were not passed on. These included the club approval for any possible cross-breeding of PBGVs dating back to the 1950s which needed the President's signature. During this changeover, the decision was made to close the RCGV containing the origins of the club, hand over the studbook and all registration records to the Societe Centrale Canine and adopt the SCC's similar registration system, which proved to be relatively straightforward. It was also decided to discontinue the practice of allowing the two varieties of BGV to be registered out of the same litter. If a Grand appeared in a litter of Petits, or vice versa, it could not be registered. Also any hound lacking the quality to pass the examination at one year of age was not given a Livre des Origines Francais (LOF) number. The Standards were changed slightly to reflect the difference between the Grand and Petit. With the Grand minimum and Petit maximum both at 38cm (15ins), Renaud Buche felt the division should be more defined. In the ensuing years, the height ranges of both Grand and Petit were altered slightly on several occasions in an effort to either demonstrate the differences between the Grand and Petit or to accept excellent examples of the breed that might otherwise have been rejected due to their height. In 1997 the GBGV Standard height of 38-42cms allowed a 1cm tolerance to the lower limit, with a 2cm tolerance to the upper limit for exceptional specimens. 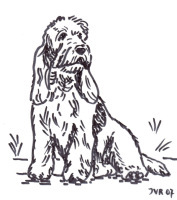 By the turn of the century, in 2001 the GBGV Standard reflected a difference between the height of males and females but there was no such differentiation in PBGVs. With each breed by then established in its own right, Renaud Buche's and subsequently Christian Oustriere's presidency followed in the footsteps of the Dezamy dynasty founded a century ago. Not only did these hounds become strong contenders in the show-ring, they were - and still are - some of the most popular hunting hounds in France today. Meanwhile, in the UK, the first club championship show for PBGVs was held in 1988. From 1992 the GBGVs joined them with their own “import register” classes. GBGV breed classes came in 1997, then their first Challenge Certificates in 2006. 2012 marked the 25th year of these shows. Thanks to photographic records from these events, we can look back at the winners over this milestone quarter century – many of whom, if not already champions, went on to achieve this honour and to become the forebears of UK and overseas BGVs of today.